If you’re a self-published author, you’re probably diligently blogging, posting on Facebook and Instagram, tweeting, hosting contests, crafting press releases, and talking up your book to anyone who will listen. All the hard work and time required to promote your book can leave you feeling overwhelmed, exhausted, and utterly burned out. At Self-Publishing Relief, our experts often see (and ultimately help!) authors suffering from the symptoms of burnout: fatigue, physical aches and pains, difficulty concentrating, anxiety, and a tendency to avoid certain tasks. Fortunately, there are simple steps you can take to alleviate the problem and recover your motivation. Recharge your mental and physical batteries. This could be devoting one day to pampering yourself, doing something you love (like skiing, hiking, or volunteering at the animal shelter), and generally removing yourself from your daily routine. Evaluate your marketing strategy. The time for an intense, focused promotional blast is right before and after your book is released—you’ll be involved in a whirlwind of social media activity, contests, and appearances. But once the frenzy dies down, you can set a consistent, yet manageable schedule (like one Instagram post per day, one blog post per week). Many authors find that creating a social media calendar helps too. You may also find it helpful to match your book promotion activities to your personality. An introvert will likely be filled with anxiety over speaking engagements or book parties, while an extroverted author may find that creating a book trailer is more work than fun. Read more about book marketing tactics you may want to skip. Concentrate on your health. Make a good night’s sleep a priority and eat a little better. Get your eyes checked if you’re suffering from headaches or eyestrain, and take a brisk walk if your back is aching. Write something new. A great way to get the positive energy flowing again is to start a brand-new project. Or head to the library and indulge in a couple of new novels you’ve been dying to read! Find inspiration from other authors. By talking to other self-published authors and exploring the websites and social media campaigns of authors you admire, you will discover interesting trends and see what works (and what doesn’t) when it comes to promotion. Use that knowledge to jump-start your own marketing campaign…once you’ve had a little break, that is. Focus on the positive. It’s hard not to be negative when you’re exhausted and your self-published book sales are lagging. Just remember that slow and steady wins the race…and it’s easy to get trapped in negativity. Promotion is part of the process of being a published author—and guess what? You’ve succeeded in becoming a published author! Ask for help. Many self-publishing companies offer marketing help. At Self-Publishing Relief, we offer our clients author websites, custom book trailers, back cover copy, press releases, and more. And our blog regularly offers suggestions and marketing ideas. Check out our Virtual Assistant Program for even more help! And finally, don’t take yourself too seriously. We know your self-published book is your baby—a project that may have been years in the making—and you’re determined to make it a success. But when you’re feeling burned out, take a step back and look at the big picture. One month of slow sales is nothing when compared to family, politics, nature, world events, or the beauty of a big blue sky. So if you’re feeling burned out, take control of your life by scheduling downtime, setting realistic goals, focusing on the positive, taking care of yourself, and asking for help when you need it. With a consistent, manageable promotional plan, you can keep the buzz going about your new book without working yourself into the ground. QUESTION: What do you do when you’ve hit the wall? 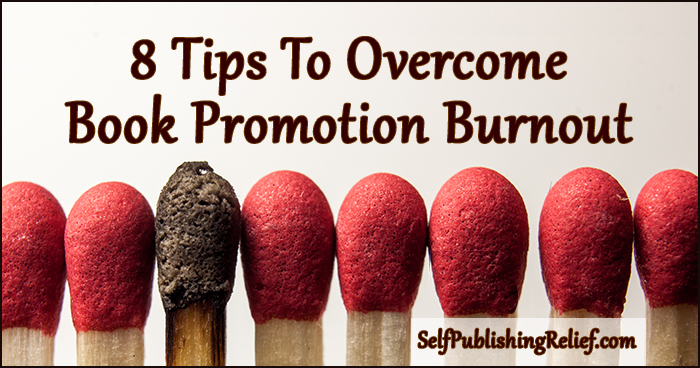 Share your best tip for conquering promo burnout in the comments section!